Home › Uncategorized › How do Feathers Fly? If anyone’s noticing, I’m writing this piece way early this month. Really with the idea of “getting ahead” as I can’t see many free days now til the end of the month. Somehow I’ve got busy again, and I’m not sure I like it. There is no question that I’m delighted to be feeling much recovered from chronic Lyme disease which has bugged me (sorry!) for the past year. But – I feel alternately frantic to be getting on with projects that I’ve had to shelve for many months, and anxious that I won’t be able to sustain it. Neither is a good state to be in, and I then start to wish…. no, not really. But it’s strange to discover that having energy is as challenging as not having it! My brother has always told me I take too much on, and now that my energy levels are closer to “normal”, the challenge is no different – how to find the Centre on a daily basis, from which to live. 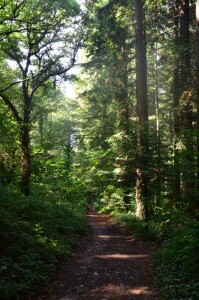 I woke early on Sunday morning to a bright, sunny, morning with a cool edge – a hint of autumn. I usually have a short walk with Selkie on a Sunday along the river bank towards the bridge. Today we just kept walking. I found myself crossing the bridge and going up into North Woods, where there is a warren of footpaths meandering sometimes close to the river, sometimes in dense woodland. Selkie and I were both following our noses. Along the way I espied moorhens at the weir, female mandarin ducks and just the hint of an otter diving, from the bridge. Before we set out I happened upon a quote attached to an image of Hildegard of Bingen: “I am a feather on the breath of God”. It struck a chord, and on the walk I thought about it some more. What it chimed with was the first part of my 30 day retreat when I described a numinous experience as “gentle and tender as the touch of a feather”. As I’ve written before, it was a pivotal moment in my life, a point of true conversion – to a Relationship I’ve been seeking for many years. But it wasn’t anything I would have expected, no flashes of thunder, or voices from heaven. Just a very intimate moment of knowing and being known. It is the place from which I desire to live, so long as I don’t get too consumed by well, consumption. We walked as far as Still Pool on the pebbly river bank opposite the sandy bank where I swim from regularly. 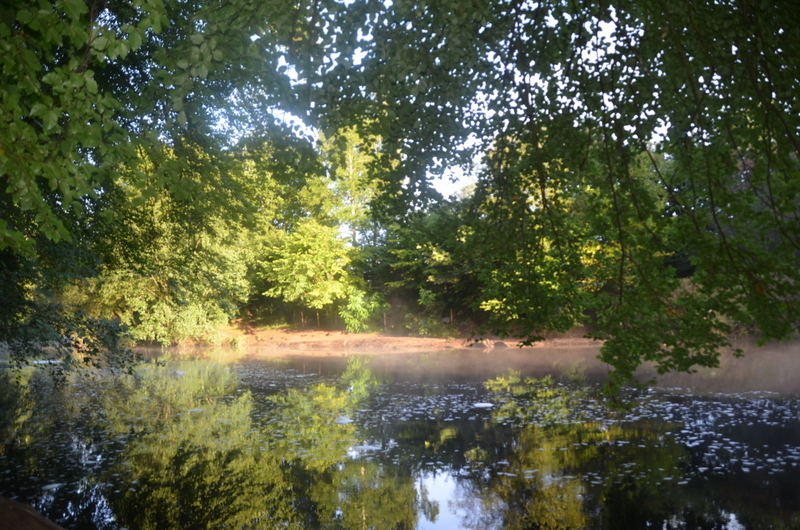 It was a lovely view, with the sun dappling through the beech trees onto the river. And a dipper delighted me yet again doing what it does best, dipping in and out of the water, drinking delicately, quickly diving under and back to shake its’ feathers dry. On the way back I picked up a feather, a visual reminder of the image I started the walk with. I was aware then that this spontaneous walk had reconnected me with my Centre, a spacious place, where nothing is pressing, and the “to do” list is in the right perspective. As Hildegard says “The feather flew, not because of anything in itself …. ” There’s the rub, because it’s almost impossible not want to put our activities and effort first. 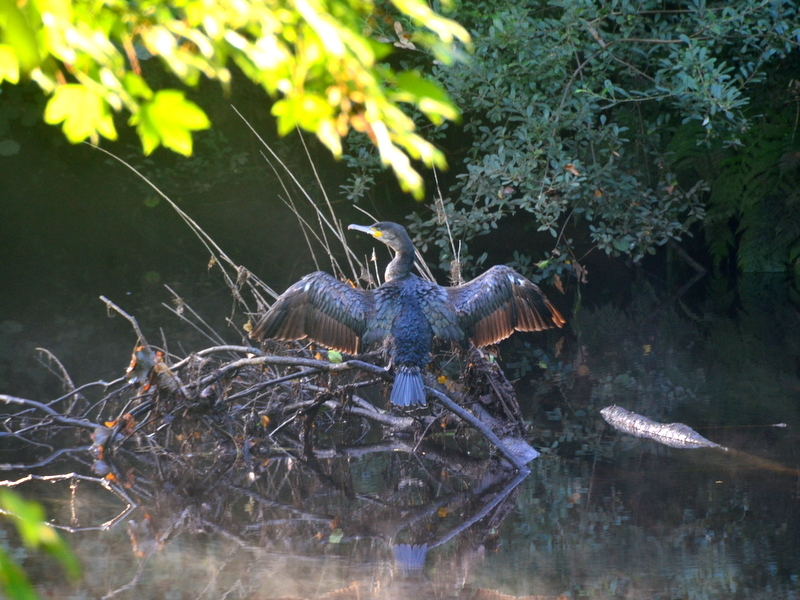 Back through the woods, over the old bridge and just as I was walking back along the river bank, I espied a cormorant on a mound of river debris, gently “airing” its wings. No-one knows why they do this, but it’s a lovely sight. As I crouched down to capture it on photo, a kingfisher flew by, too quick as usual for the camera. ‹ What strands make up your life?